Anyway, The Tall’n has had some entertaining puzzles over the years. His last, in October last year was the tricky one with BBC’s Only Connect as its theme. Before that in 2011, we had witches on Walpurgis Night. This week, there was a cipher involved. Despite the preamble stating that it was “simple”, I still had misgivings. Additionally, there were six unclued entries which resulted in misprints in the crossing entries, and three words would need unjumbling. Although the wordplay gave the misprinted versions, those six entries took up an awful lot of real estate — 51 out of 169 squares. Not surprisingly, since five of the unclued entries ran down the grid, solving the acrosses proved somewhat problematic. 10 ILLIPE (entered as IOLIPE), 22 ALBITE (ALBLTE) and 27 ESCHAR (ESCKAR) were among few that I solved. Hopefully the down clues would be easier. And indeed they were. 1dn was … where men go for relief, i.e. URINAL (entered as XRINAL). 5 Odd bits chipped from muflon jaw bone (4) was ULNA and 6 Among others, liturgy pronounced correctly (4) was RITE (although I’m not too sure why “among others”). Eight more entries were slotted in before I came to 32 1 across, eg, advanced local network (4). This was obviously ALAN (A + LAN), and it didn’t take much to realise that 1ac was TURING, given the wartime reference in the preamble. From there, BLETCHLEY PARK was a likely fit for 4dn, and the simple cipher was revealed to be three letters forward from the original. TURING would be encoded as WXULQJ but I had it beginning with X, so that was one of the words needing to be unscrambled. A bit of research, and IN HUT EIGHT seemed likely for the first down unclued entry and ENIGMA was probably lurking somewhere too. The rest of the grid fill was finished fairly quickly, and the complete ten-word message was given as ALAN TURING, IN HUT EIGHT, BLETCHLEY PARK, DECODED ENIGMA USING BOMBE (who, where and how, bombe being the machine that was did the decoding). ENIGMA was initially jumbled as GAMINE (girl), BOMBE as MOBBE (gang live) and TURING as UNGIRT (unbelted). 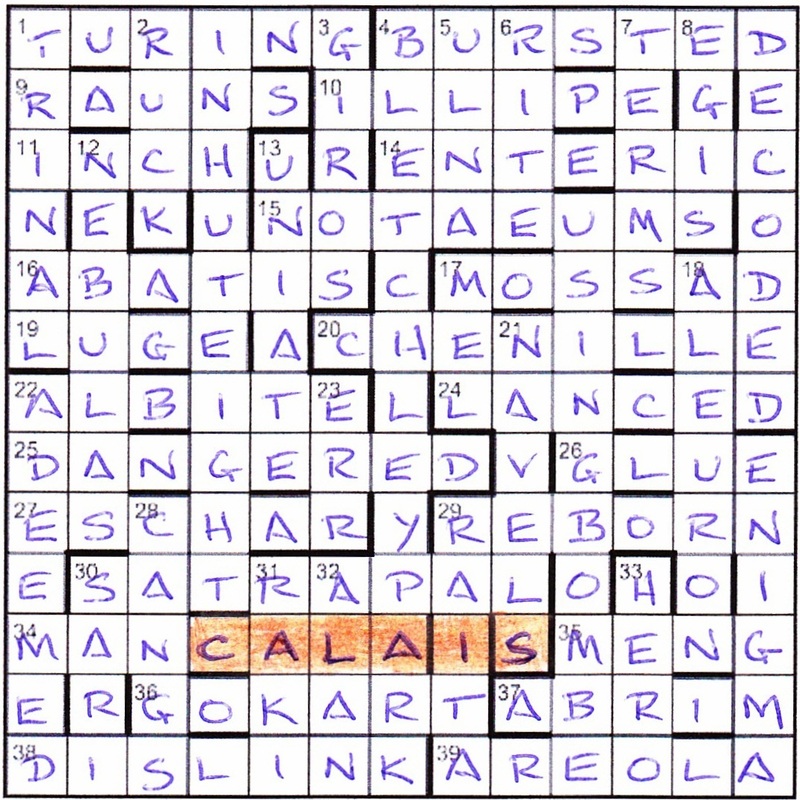 Finally, CALAIS in row 11 needed highlighting. This was the deception fed to the Nazis for the location of the Normandy landings. Thanks to The Tall’n for a thoroughly enjoyable puzzle, especially 26ac After a brief month judge returns to drink in large draughts (4)! This entry was posted on 4 September 2015 at 4:00 pm	and is filed under Solving Blogs. You can follow any responses to this entry through the RSS 2.0 feed. You can leave a response, or trackback from your own site.